Protecting your hideout is just as important as protecting your identity. Brace, strap and secure super gear that could fall or collapse. 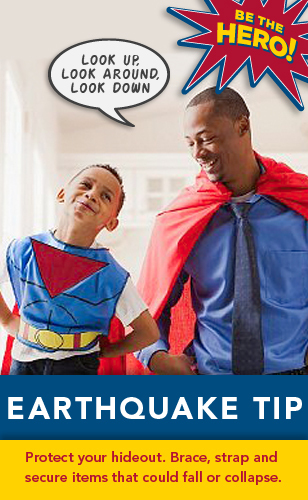 For more information on earthquake safety visit our website. To learn how you can participate in The Great ShakeOut earthquake drills visit http://www.shakeout.org. This entry was posted in Cover, Drop, Earthquake, Hold on! by federalalliance. Bookmark the permalink.